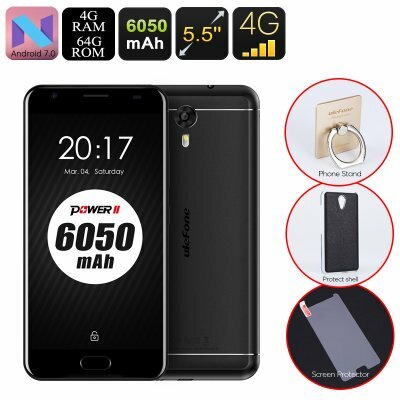 Successfully Added HK Warehouse Android Smartphone Ulefone Power 2 - Octa-Core CPU, 4GB RAM, 1080p, 6050mAh, 13MP Cam, 2 IMEI, 4G (Black) to your Shopping Cart. The Ulefone Power 2 certainly brings along what its name promises as its top notch hardware brings forth an extremely powerful performance. Not only does this Android phone handle the most demanding software and media at ease, it also comes packed with an epic 6050mAh battery that delivers a mind-blowing 63 hours of continuous talking time and 75 days of standby time. Quick-Charge technology additionally allows you to fully charge this massive battery in just under 2 hours. With this Android smartphone at your side, you’ll never have to worry about running out of juice again. Running on an Android 7.0 operating system, this Android mobile phone comes packed with the latest software features and lets you enjoy a smooth user experience. Thanks to its beautiful 5.5 Inch Full-HD display, you’ll be able to enjoy all your favorite media, applications, and games in breathtaking 1080p resolution. With free access to the Google Play store, you’ll have millions of the latest software features at your disposal – truly letting you enjoy hours’ worth of mobile entertainment at any given moment. Its 64GB internal storage and 256GB SD card slot makes sure you'll never have to feel bored again. Inside its sleek body, this powerful Android phone packs an Octa-Core CPU that has been clocked at 1.5GHz as well as 4GB of RAM. With all this high-end hardware at your disposal, you’ll be able to enjoy the most demanding Applications without ever slowing down your Android device. Supporting OTG, this Android cell phone furthermore lets you connect external hardware devices such a memory pen to your smartphone – further increasing your overall user experience. Providing you with Dual-SIM card slots and two IMEI numbers, this Android smartphone takes your connectivity to entirely new heights. Perfect for those of you that like to stay connected at local fares to friends and family while traveling abroad or for busy business men that wish to separate their work and private life with one mobile phone – this Android smartphone will always keep you connected. 4G connectivity further increases your overall connectivity by letting you enjoy the fastest mobile data speeds out there. Whether you simply like to browse the web, stream movies, or download files – nothing is too much for this amazing Android phone.